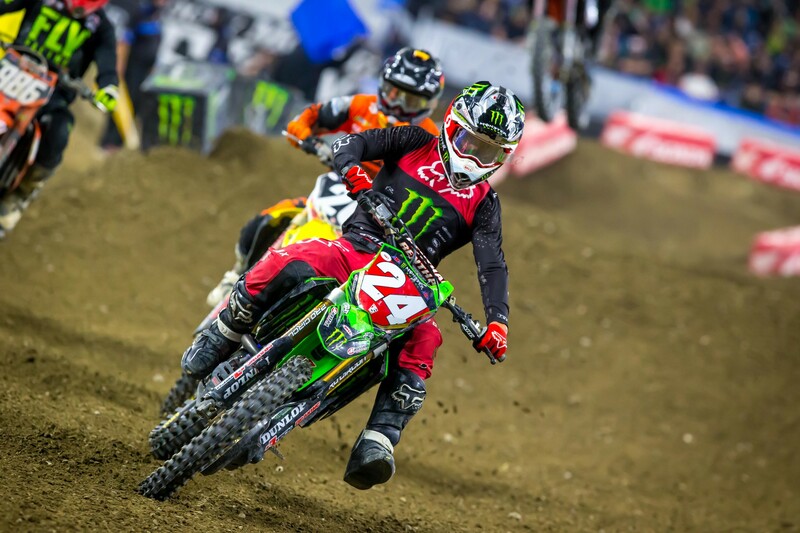 Round 11 of the Monster Energy AMA Supercross Championship took place at Lucas Oil Stadium in Indianapolis, Indiana, and it was a challenging night for many riders. We also saw one streak end and another continue with no end in sight. 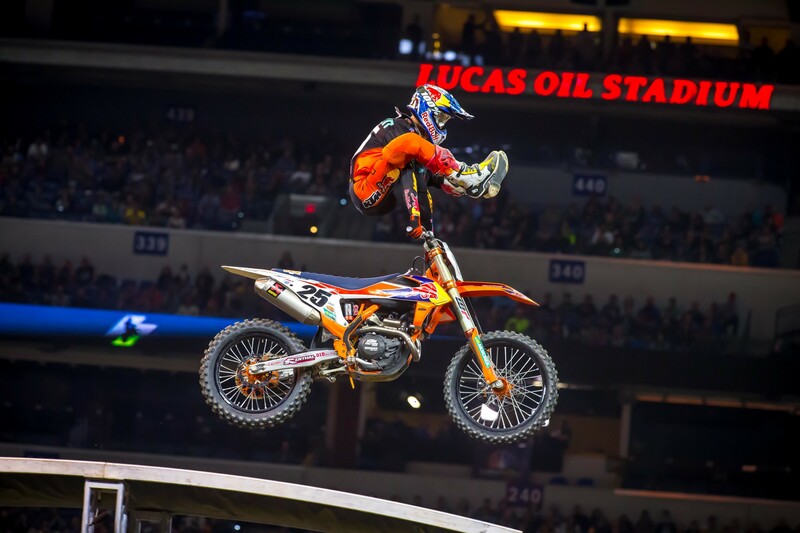 Red Bull KTM’s Marvin Musquin led every lap of the 450SX main event to take his first win of the season but it wasn’t an easy one. The Frenchman had tremendous pressure from Rocky Mountain ATV/MC-WPS-KTM’s Blake Baggett for a majority of the main event and, at times, it looked like he wouldn’t be able to withstand it. Baggett caught Musquin from four seconds down and used some clever lines in the whoops to get a wheel in on the #25 but he couldn’t make it stick. It was the seventh career 450SX win for Marv and it was fully earned after he’s shown some speed the last few weeks but hasn’t gotten the start. This weekend’s track was fairly basic so the start, maybe more than usual, was very key. Musquin nailed that and the rest was simply him trying to control the #4 and get through the usual lappers. With his win, Musquin moved into second in the points, seven ahead of third place and perhaps for the first time all year, we see some riders separating themselves a bit. Baggett did everything one could do but win the race. He had a race similar to the one he won in Glendale where he got better as the main event went one. Lappers didn’t do him any favors but they also hurt Musquin at times. Blake probably could’ve gotten a bit dirtier if he wanted to but he didn’t really push the issue. After his win Baggett was a bit up and down but he’s been on the podium two out of the last three races. Points leader Cooper Webb did what he had to do yet again to grab a spot on the box and has a 14-point lead with six rounds to go. Webb, like at some past races, didn’t stand out all day but rode well in the main to grab some valuable points on a day when he didn’t have his best. His pass on Monster Energy Kawasaki’s Eli Tomac was certainly pretty aggressive but it was more of a case that he was out of control than anything malicious. Webb was right there if anything happened between Musquin and Baggett, which certainly got pretty close. Tomac didn’t have a good night. After his win in Detroit, he finished sixth the following week. He won Daytona last week and this week went from second to a distant fourth. Once again we’re left with more questions than answers from Eli but the good news is he’s poised to win Seattle this weekend if this pattern continues. Dean Wilson won his first heat race of the year in which he had Musquin, Tomac, and Honda HRC’s Ken Roczen all over him. It was a good step for Wilson and although he didn’t get the start he needed in the main event, it was still a good night as the heat showed what he’s capable of. If anyone knows what’s wrong with Roczen, let us know. Kenny rode ok but that’s four straight weeks that he’s been off the podium. He didn’t look bad out there, he just didn’t move forward from a so-so start. 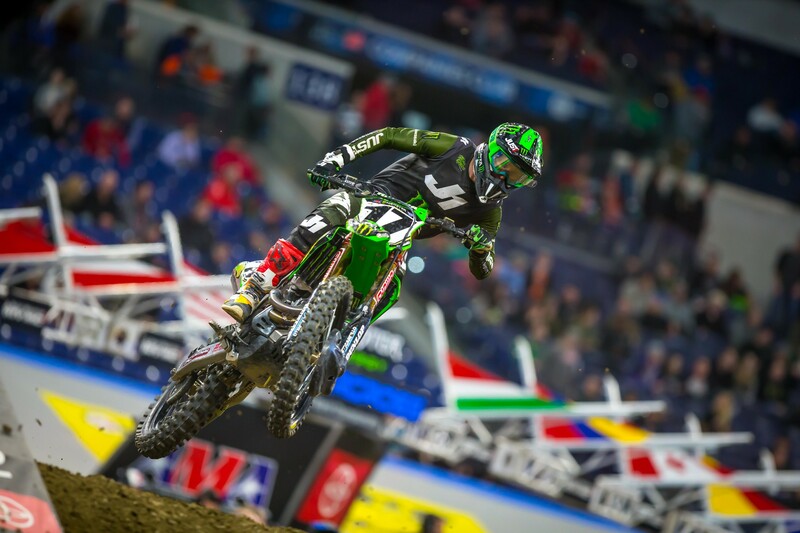 Joey Savatgy, Tomac’s teammate, was second early on but fell. He did qualify the fastest for the second time this year. Mistakes are holding him back but the speed is there and he can run the pace. It’ll come around for the rookie soon. Monster Energy Yamaha’s Justin Barcia came back after missing two rounds and had his best finish since winning Anaheim 1. Funny how that works, huh? Barcia’s team manager Jimmy Perry told us that it wasn’t the concussion that held Barcia back from racing last week but it’s a shoulder and rib injury that was hurting him the most. Birthday boy Chad Reed showed speed but he crashed early on in the main event and had to come from last up to 12th. At one point he and Justin Hill were 21st and 22nd, and that’s not good for anyone. Speaking of Hill, he had his best race of the year last week and looked frisky in practice. The team seemed to be confident that he would turn things around, but Hill didn’t get the start he needed to and then jumped into the back of Tyler Bowers early on, went down, and knocked the wind out of himself. Speaking of frisky, Bowers looked great in qualifying practice and was on pace for a good finish in the main event before… something happened. Not sure, but he couldn’t seem to get into the top ten. Lately he’s been battling the flu and the effects have knocked him back a bit but he says he’s better. Indy marked the first main event for the 722 #97 Adam Enticknap who took the last spot into the 450SX main via the LCQ. It’s taken 11 rounds but he did it with his best riding in a while. Adam credited his starts as a reason as he worked with Alex Martin’s coach this week. In 250SX, it was business as usual for Monster Energy/Pro Circuit Kawasaki’s Austin Forkner who faced some adversity when he was laying in the first turn in his heat race. Forkner got up a bit slowly but then started circulating at his usual pace to get up to fifth by the time the checkers flew. 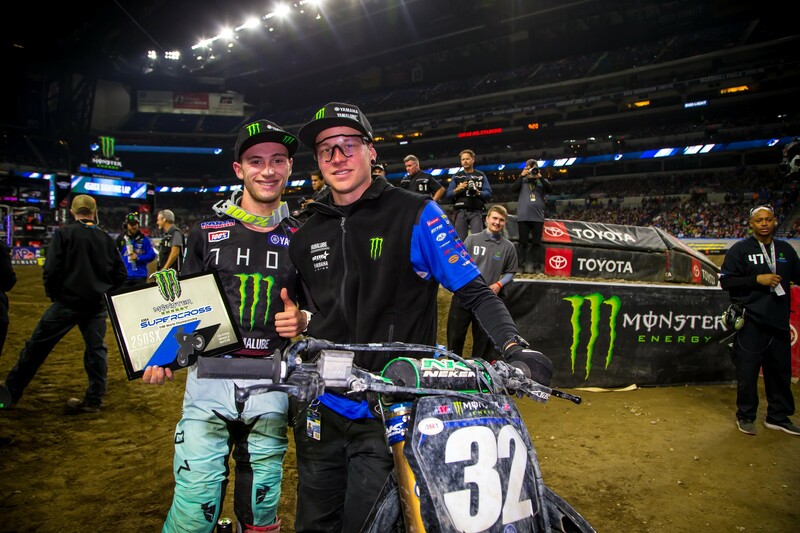 But if GEICO Honda’s Chase Sexton and Monster Energy/Yamalube/ Star Racing Yamaha’s Justin Cooper were hoping that the poor gate pick would hold the #24 back from a perfect streak of winning every East Region-only 250SX race, they were out of luck. Forkner grabbed the holeshot and took off from there. Early on in the race he held an eight second lead and it was all over. Forkner rode terrific yet again and has led all but three laps of the 250SX East-only this season. Sexton grabbed second early on from Forkner’s teammate, Martin Davalos, and then basically rode by himself the rest of the main event to get another runner-up spot. Cooper got third but only with a very-late pass on his teammate Mitchell Oldenburg. Cooper was pushed out in the first turn and had to fight from way back in a great ride. Oldenburg, who just became a father this week, had to be bummed he couldn’t hold onto his podium spot. JGR/Yoshimura Suzuki’s Alex Martin sent it into the first turn off the start and found himself on the ground and dead last to start the race. Martin had a good ride, showed good speed all day (qualified second), and fought his way to ninth by the time the race ended. Davalos dropped a few spots back after showing some real speed in the heat and early on in the main event. He ended up fifth on the night. CTR Yamaha’s Josh Osby had himself a very good race. Early on he was battling for a top five when he got pushed out onto the concrete and had to come from 13th up to eighth in a strong ride. His other two teammates, Justin Thompson and Bradley Taft, also made the main which is the first time the team put three riders into the main event. Brandon Hartranft was fast all day long but crashed twice in almost the same spot while running sixth and unfortunately for him, could only get a 12th, but in qualifying, the heat, and early in the main, he was solid. 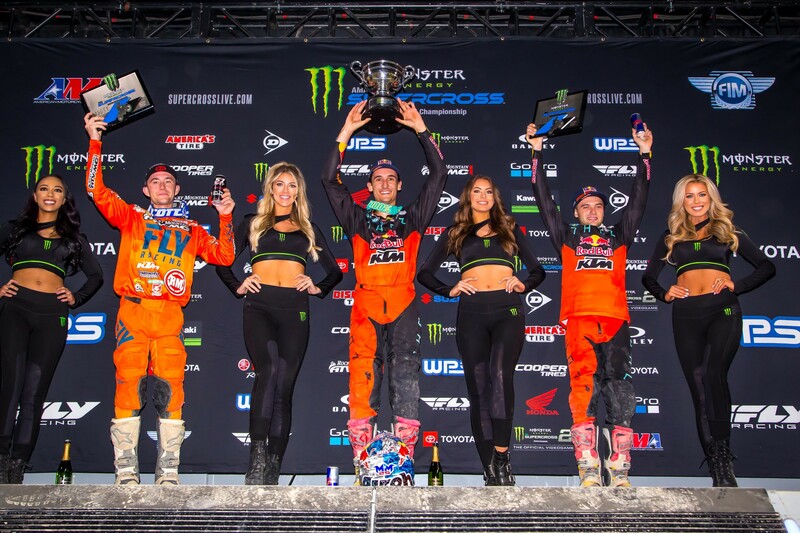 Red Bull KTM Factory Racing’s Marvin Musquin claimed his first main event victory of the 2019 AMA Supercross season at Indianapolis’ Lucas Oil Stadium.